CHIHARU SUGAI (03/04/1954 - 09/26/2018) has always been fond of the arts, and is well known for his love of rare musical instruments such as the biwa. Thus when Korin began to carry knives, it was only natural for him to become fascinated in the dying art of knife sharpening. He understood that in order to carry Japanese knives in the United States, Korin needed someone who fully understood how to care of them as well. He first began taking knife-sharpening lessons from Suisin’s president, Junro Aoki in Sakai City. When Mr. Aoki felt that he has taught Mr. Sugai all that he knew, he directed Mr. Sugai to Sakai City’s blade making association chairman, Mr. Oda. As a blade making association chairman of the most famous knife-making city of Japan, Mr. Oda taught Mr. Sugai the basic foundations of knife sharpening. Even after several years of being taught by one of the most famous blade makers. Mr. Sugai yearned to learn more, and asked Mr. Oda to introduce him to Japan’s number one knife sharpener, Mr. Shouzou Mizuyama. 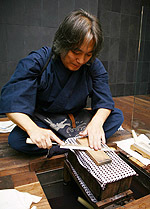 Although Mr. Mizuyama has taught other knife sharpeners specific techniques, he had never taught an apprentice extensively. Regardless, Mr. Sugai received permission to watch as much he pleased, and he did just that. For three years, Mr. Sugai traveled back and forth to Japan four times a year to observe Japan’s best at work in hopes to learn as much as he possibly can. In 1999, Mr. Mizuyama recognized Mr. Sugai’s determination and accepted Mr. Sugai as his only apprentice. Under Mr. Mizuyama, he learned the true art of knife sharpening. Mr. Sugai continues to return to Japan several times a year to learn under his 84-year old grand master. He uses his extensive knowledge of knives to sharpen knives, and check the knives that Korin receives from manufacturers to ensure their quality. He also shares his knowledge with our customers by visiting the country’s leading culinary schools, and sharpens the knives of chefs from renowned restaurants such as Nobu, Bouley, Morimoto and many others.